currently scheduled for mid 2012 is a possible new live dozey lumps album, taken from the source tape of the recently unearthed video concert. until this tape was recovered, it had been thought that there would always only be one dozey lumps album, but it looks like we might now have a short live album as well, if the tracks all prove to be sonically viable. there are very few photos of the Dozey Lumps in existence, and while they did a fair number of live performances, no gig photos have yet to surface. if anyone has any other shots of the band from other gigs, please send them in to us at pureambient@yahoo.co.uk and we will post them in the gallery. of course, you can now see the band performing live on video, filmed at a gig in la mesa, california, in july 1991, via the video clips on the dozey lumps videography page. 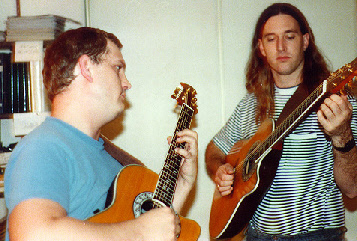 consisting of bryan helm and dave stafford, both on acoustic guitar, the dozey lumps were originally formed in 1988 as an acoustic guitar duo working in the new standard tuning. during the period 1988 - 1992 they composed and performed a unique and unusual repertoire of about 25 original songs, combining elements of beauty, dissonance and humour. the band often composed songs that were far beyond their current facility to perform, thus spurring them onwards into the realms of hazard. their now legendary live performances were often received by audiences with a curious mixture of incredulity...and laughter. the dozey lumps ceased performing in 1992/1993 as their interest shifted to a new endeavour, the ambient electronic band bindlestiff. in 2009, a videotape (just digitally re-mastered for this project) of one of their gigs was unearthed, this new source may eventually form the basis of the first and only “live” dozey lumps album. ironically their one “studio” album - “one lump or two?” - is comprised entirely of live recordings, made at various performances over the four years that the band existed. in fact, the band had an extended existence, because while they had stopped composing, rehearsing or performing as the dozey lumps - probably some time in 1992 - as much as two years later, they still would occasionally whip out their acoustic guitars and perform an old piece of dozey lumps repertoire such as “just like fog (bank)” or the untitled acoustic guitar middle section of “all for knot” live (from the bindlestiff album “live” in 1994) – so, that was actually six years down the road from their humble beginnings in 1988 – a part of the “Lumps” (as they were affectionately known) still survived within bindlestiff live shows. the lumps performed when and where they could, at guitar craft courses when possible but also elsewhere in their then-southern california locality. their one album collects together the bulk of the songs that they composed, and gives a good overview of what the band were all about. some preliminary samples of the dozey lumps videos are now available at the dozey lumps videography page, giving us a rare chance to see this remarkable crafty duo in action.